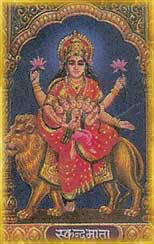 Kali is one of the four aspects of the Supreme Mother. 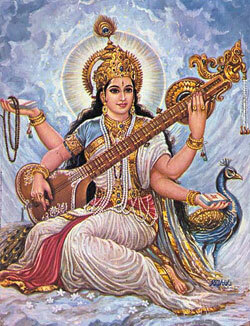 She is the Mother of power, the Mother of compassion and the Mother of speed. She wants her devotees to run the fastest. Those who want to please her should be extremely sincere, because on the one hand she is compassionate, but on the other hand she is very strict. 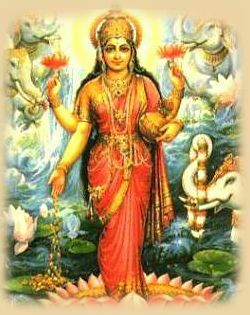 Other Mother aspects of the Supreme, like Mahalakshmi, are also compassionate; but they do not care for the same kind of speed. Mother Kali wants the fastest speed. She will not tolerate anything impure or undivine. She wants her devotees to be totally pure immediately. One has to be extremely pure, sincere and heroic in order to be her chosen instrument. She is not for the weak; she is only for the strong. She cares only for the strong who are ready to fight against ignorance. 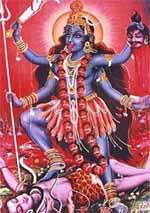 Very often when we see Kali on the vital plane, we are disturbed or frightened. She is killing many undivine forces, so she looks serious and ferocious. But on the inner plane she is full of compassion. On the outer plane she may look dark or black, but on the inner plane she is a very beautiful, golden colour. The following excerpt was taken from “The Great Masters and the Cosmic Gods”, by Sri Chinmoy.